Over 100,000 residents are now dealing with a precautionary flush and boil water alert from the Pittsburgh Water and Sewer Authority. This has effected eastern and central Pittsburgh residents as a result of potential giardia contamination that may be effecting the water supply. The Department of Environmental Protection had revealed low amounts of chlorine within the water in Highland Park’s reservoir at the distribution facility, and so the Pittsburgh Water and Sewer Authority received an order to inform their customers about the issue. The low amount of chlorine found in the water leaves open the potential for giardia to infect the water supply. 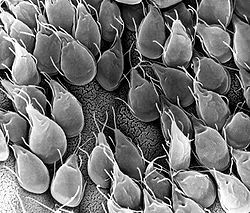 Giardia is a microscopic parasite that can cause infection of a person’s intestines as well as other symptoms such as diarrhea and nausea. It should be noted that there were no tests conducted at this time for giardia so this doesn’t mean that any was found, but the water does have the risk of harboring these little parasites. So far there have been no reports of any illnesses caused by giardia in the area. The boil water advisory means that citizens are recommended to boil their water before consuming it. This would effectively kill off any giardia if there does happen to be some living in the water supply. These alert includes a multitude of neighborhoods: Greenfield, Hill District, Highland Park, Bluff, Bloomfield, Bedford Dwellings, East Liberty, Friendship, Glenwood, Homewood, Lincoln-Lemington, Oakland, Larimer, Lawrenceville, Regent Square, Polish Hill, Terrace Villar, Swisshelm Park, Stanton Heights, Shadyside, and Squirrel Hill. Anyone that lives in these areas should turn on their water taps for about 60 seconds and then boil collected water for another 60 seconds before allowing it to cool and using it. This should be done for any water that might come in contact with the mouth, from washing dishes down to brushing their teeth. Some water filters that attach directly to the sink may be capable of removing waterborne parasites like giardia.